The work of the Cambridge Platonists has been gravely neglected due to a combination of scholarly misapprehensions, a lack of accessible textbooks, and good critical editions of their major works. The central aim of this interdisciplinary project is to begin addressing this neglect by bringing together the major established UK and overseas researchers as well as early career academics who work on, or have a close interest in, Cambridge Platonism. This will advance research on this pivotal intellectual movement. These discussions will take place at a series of workshops at Clare College, Cambridge. Contributors will be drawn from the disciplines of Philosophy, Theology/Religious Studies, and English Literature. 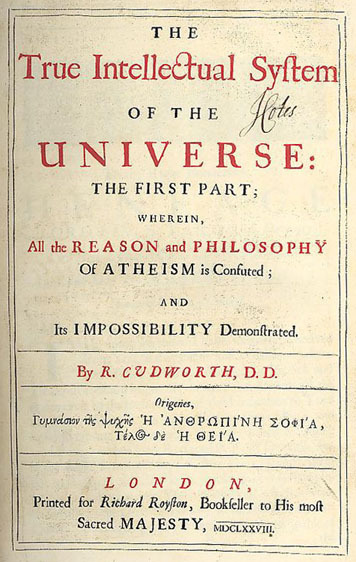 Topics covered by the project will include, but not be limited to, the formation and sources of Cambridge Platonism, their key philosophical and religious ideas, and their reception in the areas of (i) aesthetics; (ii) ethics; (iii) metaphysics (iv) early-modern women’s writing; (v) secularisation and the origins of atheism. The project is spearheaded by Douglas Hedley (PI) and Sarah Hutton (Co-PI), and it is funded by the Arts and Humanities Research Council.